Peering into the past life of this fossil took an x-ray scanner powered by a particle accelerator. What scientists saw there was mysterious: an ancient lizard had left behind its skin and teeth, but none of its bones. To tell the ghost's tale, they relied on some very modern equipment. At Stanford University, an accelerator called a synchrotron sends electrons zipping around a track fast enough that x-rays spin off of them. These x-rays are collected into an extremely bright x-ray beam that scientists can use for various projects. One application, x-ray fluorescence, lets researchers map the actual chemical elements inside on object. Other methods of analyzing an item's chemical makeup require scientists to focus on tiny slices, destroy their samples entirely, or creep along at a rate of one square centimeter a day. But the setup at Stanford lets scientists look quickly and thoroughly at larger objects while keeping them in one piece. The synchrotron has previously been used to reveal writings of Archimedes that were scraped away and painted over, and to deduce the pattern on the feathers of the 120-million-year-old Confuciusornis. University of Manchester paleobiologist Phillip Manning and his colleagues, who had worked on scanning Confuciusornis and other fossils, now turned the synchrotron's powerful x-ray beam onto an unusual fossil. The 50-million-year-old lizard specimen comes from Colorado. What's unusual is that the animal's skin is beautifully preserved, right down to the scales—but the skeleton is gone. 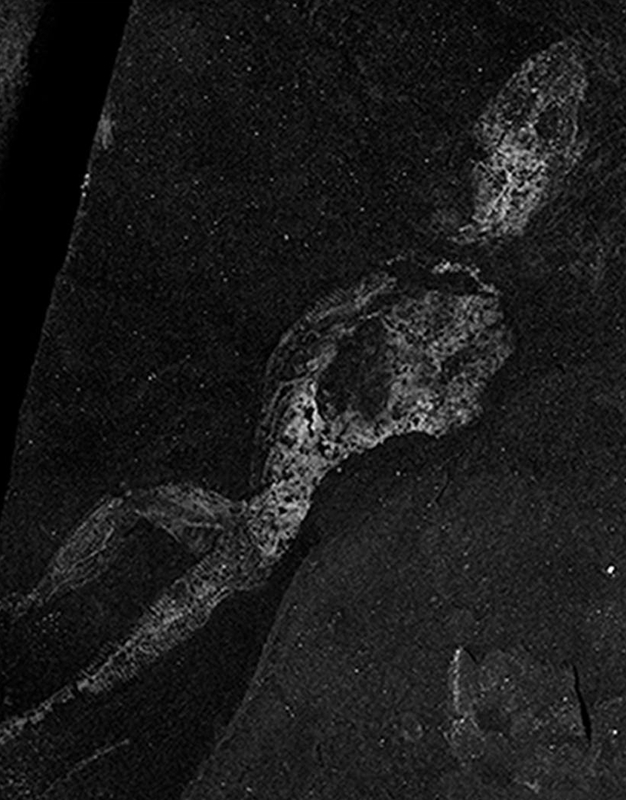 Scanning the fossil for sulfur (in the photo above) or copper produced ghostly silhouettes of the lizard's whole body, since these elements are naturally present in trace amounts throughout an organism. Tuning their scans for phosphorous brought a surprise: dots popped out of the lizard's ghostly head in the shape of a jaw. 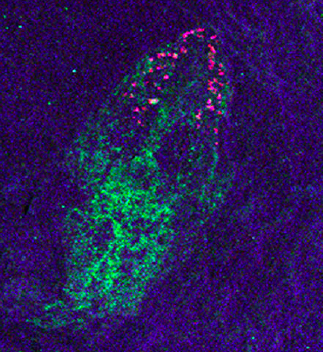 In the image above, green is a map of sulfur in the head and neck (check out the scales!). Phosphorous and magnesium are overlaid in red and blue. The authors write that this chemistry is "typical for biomineralized structures." A close look revealed two overlapping bites: a full set of lizard teeth. Before the synchrotron scanning, researchers thought the unusual Colorado fossil was a 50-million-year-old molted lizard skin. But even animals that shed their skin don't tend to leave behind their entire jaws when they do so. This animal died in one piece. Although bones and teeth have similar ingredients, the authors write that the structure of teeth makes them more resistant to dissolving. But how did the delicate skin stay intact? "If the acidity of the ground waters are high, bone would be vulnerable," Manning says. "However, high acidity is often helpful in 'tanning' skin to preserve [it]. Think bog bodies from northern Europe." As researchers continue to peer into the past with the synchrotron, Manning is narrating their progress at his blog. He doesn't anticipate running out of subjects. 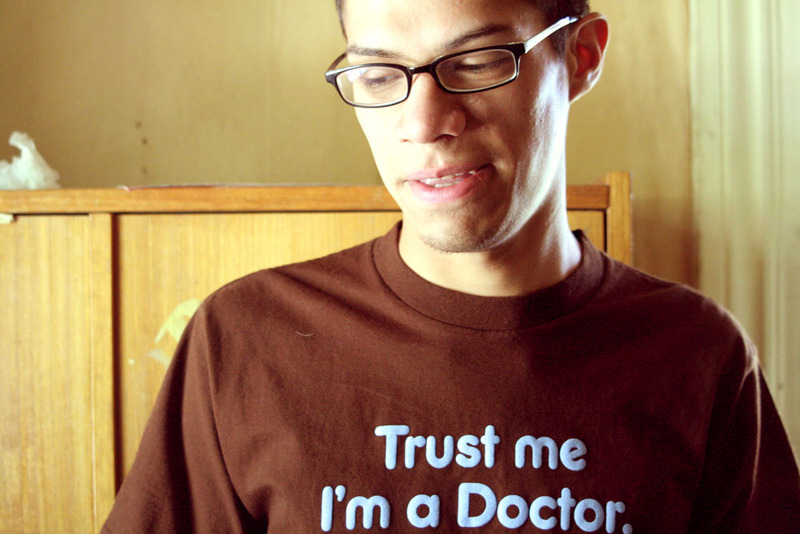 "We have a few million life forms to wade through," he says. In other words, there are plenty of ghosts of fossils yet to come.